Back in school, the group project was not always a positive experience. Inevitably, in each group, some worked harder than others while others never showed up. As a result, it could be frustrating if you're one of the team members carrying most of the load. It's slightly different in the business world since each project has a project manager and this person can hand out real consequences if team members don't complete their tasks. Even if the project manager doesn't have disciplinary authority over his or her team, any poor performance by a member can get back to their boss and reflect negatively on their career. It's likely the project manager won't get to choose the team members for the project, and won't have the authority to remove a member due to poor performance. How do you manage a project when your team members don't report to you? Here are six tips about how to lead a project when the team members don't report to you. Before you even have your first team meeting, sit down with the person who assigned you to this project and talk about management's expectations. This is easiest, of course, if you and all of the team members report into the same person, but even if not, you'll want to have this conversation. Do you have the power to remove and replace people on the team if they aren't working out? Does this project take priority over other projects? If not, then where does your project sit in the hierarchy. In other words, can you tell your team members they need to stop doing a different project to meet a deadline? If you have issues with team member performance, will the boss with disciplinary power back you up, or are you considered an equal with team members? If you haven't done so already, ask what the goals are for the project and the expected timeframe to completion. However, getting buy-in from your boss as to whether the project is a top priority can help you sway members to work as hard as possible. And don't be afraid to be direct with your boss by mentioning that you want to know the level of importance of the project so you can communicate that message to the team. You'll want to communicate that everyone has the same goal, to get the project finished properly and on time. Also, you could follow up with your boss via email asking to confirm that the project is a top priority. Once you receive the emailed confirmation, you can forward the email to the team if necessary. It's important to remember that the team members may have other responsibilities in addition to the project. As a result, they might not consider your project a top priority for them at the onset, but that's not necessarily because they don't care or they're looking to avoid working. It's quite likely that they simply have other tasks and responsibilities that they need to complete on a daily basis. This is especially true when working with colleagues from different departments. 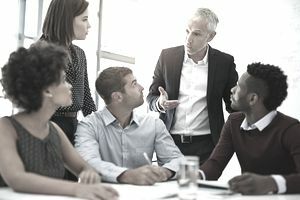 Speaking with your boss to clarify the importance of the project, the goals, and timeline, and communicating that information with the team early on can help make the process move smoother and be less stressful. When you have a cross-organizational team, it's easy to make assignments. Jane from marketing will handle the marketing tasks. Karen from finance will handle the financials. But even when responsibilities are clear, talk with your team members first. You may find out that both Karen and Jane asked to be on this team to learn more about other areas of the company, so when you assign them to their areas of expertise, they can become frustrated. This conversation is critical to having a great team relationship. Though you are responsible for the ultimate project outcome, you won't achieve great results without team members who are on board. In short, empower your team members by asking for their input and their concerns. When the project is complete and a success, the entire team can feel pride knowing that each one of them played an active role in its success. If, after talking to your team members, you determine that the only way to accomplish this task is to give assignments that one or more people will find unpleasant, talk to your boss before making the assignments. Why? You want to make sure that you have the backup you need and that you haven't neglected an option that will make the assignments more fulfilling to the team members. Everyone may know that you were chosen to lead this team because of your track record of success, but it's also important to roll your sleeves up and get into the mix of things. Taking on something difficult or unpleasant sends the message that you're a part of the team and that you care about your teammates. Assigning out the unpleasant tasks sends the message that you think you are better than your teammates. This doesn't mean that you have to do all of the lousy tasks. But make sure they're fairly divided out amongst team members. What is unpleasant varies from team to team, but every project has something that no one wants to do. Often there are numerous tasks that everyone would like to avoid. Make sure they are divided fairly, and you take your share. Remember feedback is more than saying, "great job" or "bad job" it's “that was a great job because...” and “that didn't turn out so well because...” Without the because phrases no one learns. And as long as you're looking to hand out feedback, make sure that you're accepting feedback from your team members. Again, you're empowering them to do a great job and remind them that their success is your success and that you're all in this together. By providing feedback and teaching them how to do a task, especially if you have more experience, you'll be creating a positive working environment. As the team leader, you'll be reporting progress to your organization's managers and senior leaders. Make sure that you take the information from those meetings back to your team. Additionally, let your group know what you're going to say at these meetings. Also, give everyone credit, especially when praise is involved. Is the project going well because you're fabulous? Well, of course, but don't say that. Say that the project is going well because the team is fabulous. Everyone will know that you're part of the team. But what if the project is going horribly? Do you share the blame? Yes, but only privately. You go to team members individually and work to help change their direction or contribution. If that doesn't work, you go to your boss and address the issues. If you have the power to remove people from the team, now is the time to do so, but if you don't, you can talk with the person who does. But whatever you do, don't start gossiping or complaining about your team members. It will destroy their morale and make everything worse. Remember that a successfully led team project can boost your career, advance your professional reputation, and make your work visible in your organization. The result might be additional assignments or a promotion.